A mobile karaoke DJ (also known as a KJ) should provide a complete karaoke setup for your event. A karaoke DJ should provide all necessary audio and lighting equipment, music and professional karaoke backing tracks for your event. They should deliver, set up and host the event for you and take care of all technical requirements in running your karaoke show. Equipment used by karaoke DJs varies greatly. Unfortunately some people operate very cheap setups, or don't know how to setup the equipment correctly or how to adjust it for each singer. This has given karaoke a bad name over the years. It is always worth checking what experience your karaoke DJ has, what equipment they are using and that it's suitable for the size of venue you will be using (small tinny speakers in a large hall or deafening volume in a smaller area are not desirable). Also check that they carry spares and search out testimonials from their previous customers. Recommendation from satisfied customers is always the best way of choosing your Karaoke DJ. Most modern karaoke players allow karaoke tracks to have their key, and sometimes their speed, changed digitally to suit the singer. It's worth checking this facility is available as it greatly increases the repertoire of songs for most people. Many people have their own karaoke tracks on CDG discs these days. It's worth checking your karaoke DJ has the facilities to play these discs. If they only use a laptop then this could be an issue. Good singers will seldom sing on a poor karaoke setup. If you have people attending your event who can sing well then it's worth your time ensuring your karaoke DJ has a setup that will satisfy these people. If the setup sounds poor or singers are unable to hear themselves sufficiently well then good singers will likely be put off taking part which greatly detracts from the overall karaoke experience. High quality equipment that is setup well, includes professional vocal effects and perhaps includes a foldback (monitor) speaker for singers should ensure this situation is avoided. Also consider your guests. People like to be able to see the words themselves so they can sing along. Check that your Karaoke DJ provides at least a second screen for this purpose or that they can connect into additional displays at your venue (check with your venue on the options available). Karaoke song selection also varies greatly from one supplier to the next. Some karaoke providers carry tens of thousands of songs in digital format (on a laptop for instance). Others will only have a few hundred songs. In practice, a well balanced collection of around 3000 songs covering all eras and genres of music, including all the karaoke classics, should satisfy the vast majority of karaoke fans. If possible, ask your karaoke DJ to supply a list of their karaoke tracks so you and your guests can check through them beforehand. Also check that the karaoke books provided by the DJ are well maintained and easily referenced. It's common to find tatty or out-of-date books in use. Some DJs have stopped using books altogether under the premise of 'We have everything', but people love to browse through books for songs to sing so it's an area worth checking on. Typically a Karaoke will be combined with a Disco to ensure a great atmosphere is maintained throughout the event and those guests who don't participate in singing can still have a great time and request music to dance to. Always check with your chosen DJ on the extent of their music collection and the genres they cover. Some DJs specialise in certain musical genres. Typically a Karaoke DJ will be extremely versatile and cover most genres, but it's always worth checking with them and ensuring that the music they will play will be suitable for your event and expected audience. Modern sound equipment in use by karaoke DJs will also allow input from MP3 players such as iPods and USB devices. Many people have music they really enjoy on such devices and may ask if it can be played through the DJ's setup if the DJ does not have that music already. It has become a very useful facility to have available in the last few years. 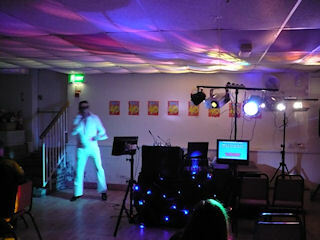 Most karaoke DJs will carry disco lighting to add atmosphere to your event. The lighting setup required will obviously vary depending upon the venue you are using and the occasion, so always check with your DJ that suitable lighting will be available. A mobile Karaoke DJ should have Public Liability Insurance (PLI) and carry the certification with them. The level of insurance required varies from venue to venue, typically from £2 million to £10 million. Always check your venue's requirements and that your selected Karaoke DJ meets the requirements. Your DJ's equipment should also be Portable Appliance (PAT) tested annually and they should carry the appropriate certification with them. If your karaoke DJ is using music or karaoke tracks that have been converted from the original media they were purchased on (eg MP3 files on a laptop converted from CDs) then they should have a ProDub licence issued by the MCPS and carry appropriate certification. Failure to supply PLI, PAT and, where applicable, ProDub certification at certain venues can result in a DJ being refused access, so it's always worth checking with both the venue and Karaoke DJ that the requirements are being met. Please see our articles on this site for full details on PLI, PAT and Produb. In summary, mobile Karaoke DJ hire is the best way to achieve a hassle free evening of music and singing without having to worry about equipment setup, what music to play, changing discs and trying to keep everybody happy. Typically any karaoke event larger than a small house party is best suited to hiring a mobile Karaoke DJ. Taking the time to ask a few informed questions of your chosen karaoke DJ, based on the information provided above, will hopefully ensure that your event is a resounding success and you and your guests have a fantastic time. For additional peace of mind, karaoke DJs who are members of a recognised trade organisation should operate to set professional standards so seeking such membership too is a good idea. Please see our article on trade memberships for full details.